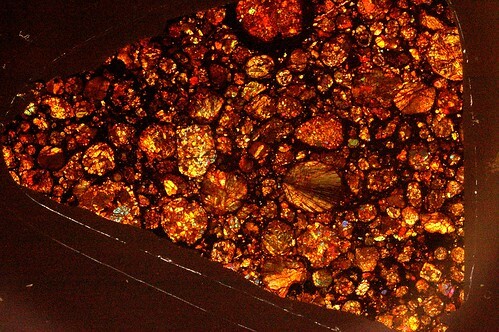 Thin section of a meteorite, photographed using the camera polarizing filter sandwich method. The meteorite is one of the Jiddat al Harasis type L3.1 chondrites. 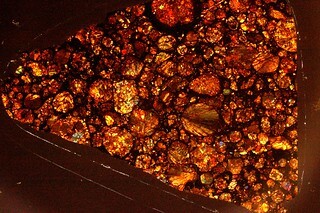 Several of the chondrules show interesting recrystallization patterns. The lighting in this image is cross-polarized (meaning that the polarizers are aligned at right angles to one another, so the background light is blocked everywhere except where the crystals in the minerals have changed its axis of refraction). This image was made at a macro setting of 1.8:1 using a Bowen Illumitrans slide copier and a Pentax istDS DSLR and enlarging lens. ISO 800 and four flashes from the copier's strobe at F22. No Photoshop other than autobalance to restore white balance and slight gamma stretch. Slide acquired from Meteorite Man Steve Arnold.